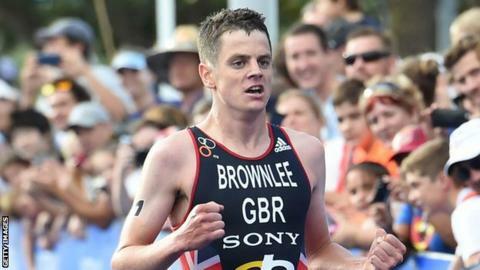 Olympic triathlon bronze medallist Jonny Brownlee says 2015 has been a year to forget. The 25-year-old has been out of action since suffering a stress fracture to his leg in late June and missed last month's Rio test event which could have secured his Olympic selection. Brother Alistair, the Olympic champion, is also currently on the sidelines after undergoing ankle surgery. "It's been a bit of a nightmare year for us both," Jonny told BBC Sport. "We are on the back foot when it comes to qualifying for Rio but hopefully having a break now means we will come into next year's races fresh." Jonny will miss Sunday's World Series event in Edmonton, Canada, but he is set to compete in the World Series final in Chicago on 19 September and although a medal there would secure his Rio spot, he says he will not be racing at full strength. "I hope to race in Chicago but it won't be racing as I know it which is setting the pace from the front and being as fit as I can," he admits. "It will be the first time I'm as not as close to top shape as I possibly can be. "I have done as much running in the last two weeks as I have done over the previous three months but being on the start-line will be a positive for me." The World Triathlon Grand Final on Friday, 18 September (women) and Saturday, 19 September (men) will also be shown live on the BBC.